Japanese Culture: Breadshop or Cake Shop? Bread Shop or Cake Shop?, a photo by timtak on Flickr. 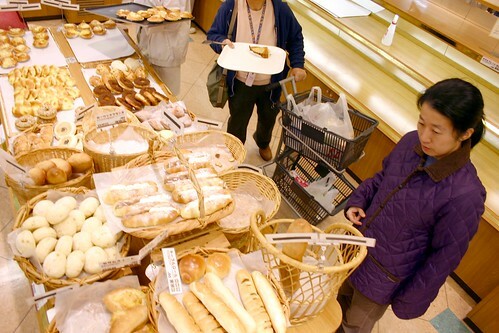 Yasuko is in a Japanese "breadshop" about to purchase the last "baguette". To me most Japanese bread tastes like cake even though it looks deceptively the same as its European counterpart. As my French professor used to say, "soft" (read texture-less) Japanese bread can be quite a disappointment (Louyot, 1999) for Europeans. In Japan the important thing is that copies or things look the same. I think that the Japanese may even delight in having things look the same but taste different, or not taste of anything at all - such as in the case of plastic food. Certainly they like to copy things at different sizes, particularly in miniature (Lee, 1984), but sometimes as giants. This is because in the visual world in which Japanese live, there is no taste, nor size, nor even body (Ma-Kellams, Blascovich, & McCall, 2012). Louyot, M (c. 1999) Personal Communication.